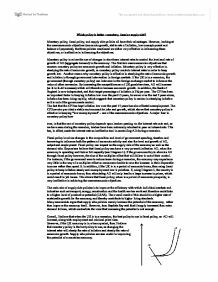 Monetary policy, fiscal policy, and supply side policies all have their advantages. However, looking at the macroeconomic objectives (economic growth, stable rate of inflation, low unemployment and balance of payments), the three policies mentioned are either very effective in influencing these objectives, or ineffective in influencing the objectives. Monetary policy involves the use of changes in short term interest rates to control the level and rate of growth of AD (aggregate demand) in the economy. The first two macroeconomic objectives that concern monetary policy are economic growth and inflation. Monetary policy is very effective in steadying the rate of economic growth, as monetary policy controls interest rates in order to keep growth low. Another reason why monetary policy is effective in steadying the rate of economic growth and inflation is through government intervention in foreign markets. If the UK is in a recession, the government (through monetary policy) can intervene in the foreign exchange market to influence the value of other currencies. By increasing the competitiveness of UK goods/services, AD will increase (as X in X-M increases) which will therefore increase economic growth. In addition, the Bank of England is now independent, and their target percentage of inflation is 2% per year. The CPI has been an important factor in keeping inflation low over the past 15 years, however over the last 2 years alone, inflation has been rising rapidly, which suggests that monetary policy is useless in steadying inflation as it is out of the governments control. ever, is that the use of monetary policy depends upon lenders passing on the interest rate cuts and, as we have seen during the recession, lenders have been extremely reluctant to pass on interest cuts. This has, in effect, made the interest rate an ineffective tool in controlling AD during a recession. Fiscal policy involves changes in the composition and level of government spending, taxation and borrowing to influence both the pattern of economic activity and also the level and growth of AD, output and employment. Fiscal policy can impact on the supply side of the economy as well as the demand side. 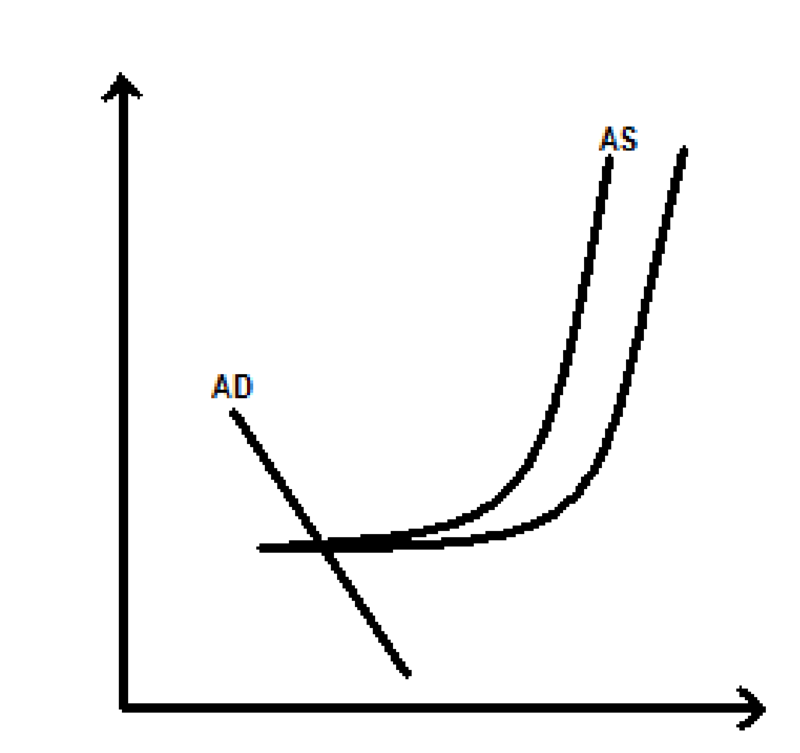 Keynesians believe that fiscal policy can have a very powerful effect on AD, when the economy is operating well below full capacity (see Diagram 1). If the government try to stimulus AD through fiscal policy however, the size of the multiplier effect that will follow is out of their control. For instance, if the government were to reduce taxes during a recession, the economy may experience very little in the way of a multiplier effect as consumers decide to save the increase in their disposable incomes rather than spend it. In addition, if the UK is in a period of economic boom, then using fiscal policy to keep inflation steady and unemployment low is pointless. If, using Diagram 1, the country is in a period of economic boom, then stimulating AD will only lead to a large increase in prices, which could result in job losses. This shows that fiscal policy, when in a period of economic prosperity, is very ineffective in achieving the macroeconomic objectives. The main aim of supply side policies is to improve the efficiency with which individual markets and industries such as transport, energy, construction and the health service work and therefore contribute to a higher level of productive potential (LRAS). The overall result of this should be a higher rate of sustainable growth for the economy, and thereby contribute to higher living standards. Many economists argue that supply side policies merely increase the potential of the economy, rather than improve the economy itself. However, Juan Baptiste Say said that if supply increased then extra demand follows, which contradicts the view that increasing the potential is not enough. Overall, I believe that when the UK is in a recession, the best policy to use is fiscal policy, as AD will increase, along with employment and minimal price rises. However, if the UK economy is in a boom period, then I believe that monetary policy is the best policy to use, as changing the interest rates will steady the rate of inflation and steady the rate of economic growth. Supply side policies are also useful in improving the potential of a countries economy. Using Fiscal Policy to Improve Employment. A report into supply side policies in the UK. What are the main macro-economic policy objectives? Too many injections from the fiscal policy will cause public spending to increase too much, which may then cause a consumer boom. This means there will be a shortage in the numbers of workers causing a rise in wages and prices. In 1980 to 1990, inflation occurred, there was an unforeseen inflation followed by deflation, so it created the uncertainty, which obstructed the business decision-making. However, Inflation is a good sign for the recovery of slump economy, but Government should keep it in the acceptable level which is around 2.5%. The allocation for Police forms the major component under this classification. At Rs 13967 million it is higher by 11% as compared with the revised estimates and 16.9% as compared with the budget estimates 2003-2004. The following table provides the details. Along with the loss of tax this is a 'double whammy'. With higher employment, firms are likely to do better and make better profits. If they make less profit because of unemployment, they may have fewer funds to invest. So, unemployment causes loss of profits. How does this process work? The multiplier can either be in inflation due to incomes or in a recession due to lack of investment. In the case of inflation, as the average price level rises, workers demand more pay in line with inflation, but then to maintain the wage gap, people on higher incomes also demand a pay rise.